Here we go again. I guess many of you will have read by now that Vettel was quick in FP2, and is clearly favourite for an eighth win in a row. And indeed, he is. The evidence is that this could be a very easy win indeed; no-one was close, and it probably doesn’t matter what strategy he chooses. It will take a first corner incident, reliability, or perhaps a puncture to stop him. The strategy in Austin looks like being a one-stop race, as the hard tyre lasts pretty much forever, and the medium looks like being good for the 18-20 laps. However, the medium is quite a bit quicker at the start of a stint, to the tune of around 1.3s, but it does degrade less quickly. As the hard degrades less quickly, the medium is quicker over a 20 lap stint, but not by enough to make two stops worthwhile. I reckon that those who can one stop, will. Given that there were many quick laps at the end of medium tyre stints, suggesting a lot of tyre left, this is likely to be pretty much everyone. The relative pace of the cars is shown in the chart below. 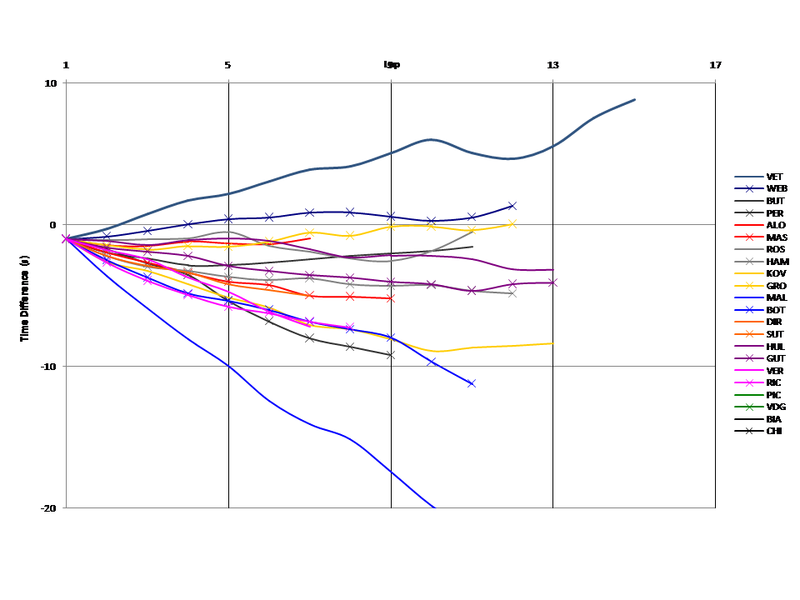 This is a race history chart showing the progress of the cars during their (mainly medium-tyred) stints. Each line represents a car, and the gradient represents the speed of the car. The fact that Vettel is fastest, and clearly so, is easy to see. Next up are Webber and Grosjean. Similar pace is also shown by Rosberg, Alonso and Button at different stages of their stints, so the battle for the podium places could be quite competitive. Given that McLaren are usually faster on Fridays than in the races, it is likely that it is once again Lotus, Ferrari and Mercedes fighting for best-of-the-rest. If anything, Lotus look best. All three team mates (Hamilton, Massa and Kovalainen) were significantly slower, although Kovalainen did speed up through his stint, and his final laps were very good. I can see him doing his career a lot of good this weekend. Hulkenburg continues to be thereabouts and must be expecting points again, and Gutierrez is not a long way behind. Force India appear to be less quick here than in the previous few races, as do Toro Rosso. Ricciardo is again looking stronger than Vergne – he has looked better and better since he signed for Red Bull – a good sign. Williams, though, are closer than they have been – Bottas was a similar speed to Force India/Toro Rosso and there is a chance that they could be in the battle for points. He could do with a good weekend . Why do you suppose that Hamilton ran so much longer than everyone else. He ran 17 laps to everyone else’s 9-12. Is it just down to the new chassis? I then got very curious and did a lap by lap comparison starting with lap 3 of Hamilton’s stint to lap 3 of Hulkenberg’s (lap 20 vs lap 21 on the FIA sheet) throwing out anything in the 1:45’s or greater (assuming traffic or similar). I found Hamilton’s average laptime to be 1:44.198 and Hulkenberg’;s to be 1:44.170 (rounded to the nearest .001) with 9 usable laps of data. My question is about fuel load effect. If I assume that Hamilton had an extra 5 laps of fuel then should the calculated cumulative fuel load effect be .529 (.0192 per kilometer *5.513 km * 5 laps) and if so I got an average lap time of 1:43.669. This would seem to put him around Button/ Rosberg Alonso etc.and around .7 off Vettel which seems to be correct historically. Then I realized I hadn’t had a math class in 30 years and had no real idea what I was doing, so my 2nd question is, is it a valid assumption for Hamilton to have had 5 laps more fuel on board than Hulkenberg for that stint, or do they all generally start on full race fuel. Looking at the group of slower team mates I might also think that the slower group is on full race fuel and the other on mid stint fuel to get a better handle on vehicle dynamics etc., through the whole first stint. I know you do pay attention to fuel, but are there markers you use to decide when fuel loads are different enough to make allowance for? Anyways, this has certainly been much more fun than doing the actual work I should have been, so thanks for continuing in spite of the “pointlessness” of it all. Some of us actually enjoy it regardless. I tend to assume that they all have the same fuel load – I tried to guess for a while, but you end up just deciding whatever you think, and convincing yourself that some fast times are due to fuel load when actually people are genuinely quick. I did a little audit and found that the best guess was to take it pretty much at face value. I think that they all start pretty full as this is worst case for the tyres. I doubt that Hulkenburg was lighter. Based on last year’s race, the fuel load is about 0.1s per lap here, which fits well with your figures. Where stints look very different (say 2s off what you might think) then it is definitely fuel, and I tend to reject the data as the unknown is just too big. The big gaps between team mates can be fuel, but it can also be tyres. It is possible that Bottas is on low fuel, but he looks quite quick. My understanding was that Hamilton was asked if he wanted to try the hards, and said that the tyres were OK, so they decided to stay out and see how far they could push it. I’m not sure there is a big significance to it. The laptimes are quite quick in comparison with last year, but my guess is that they will be roughly consistent with the first stint in the race. Wow, thanks much. I really appreciate you taking the time to reply. Given the starting grid I’m guessing the strategists will be up late tonight, hopefully the rest of the race will be entertaining enough to make up for the fact that we already know who will win. Unless Grosjean decides to revert to his old self and drive directly into Vettel at T1. Which I very much doubt will happen. Thanks for the work you have done all season 🙂 Can’t wait to read you in 2014 ! Thanks. I’m just sorry that I haven’t been able to give it as much time in the second half of the season. No need to apologise, we knew you were busy with other things. Also as you’ve said in the past its hard to find the motivation to analyse the obvious and predictable. But a huge thankyou! Every post you have done has been an excellent read, great analysis, speculation and predictions. Really enjoyed it! Really looking forward to 2014 with all the regulation changes, hoping it will mix the order up and provide some close super racing. Then it might give you something to really get The intelligentF1 Model teeth into. Thanks again, have a wonderful winter. With all the 2014 changes mixing up the status quo (and the high probability that this season is going to boil down to a development race for survival) I, for one, think that your feedback would be *really* useful. I’m crossing my fingers that we’ll see your analysis resume in the next few weeks.